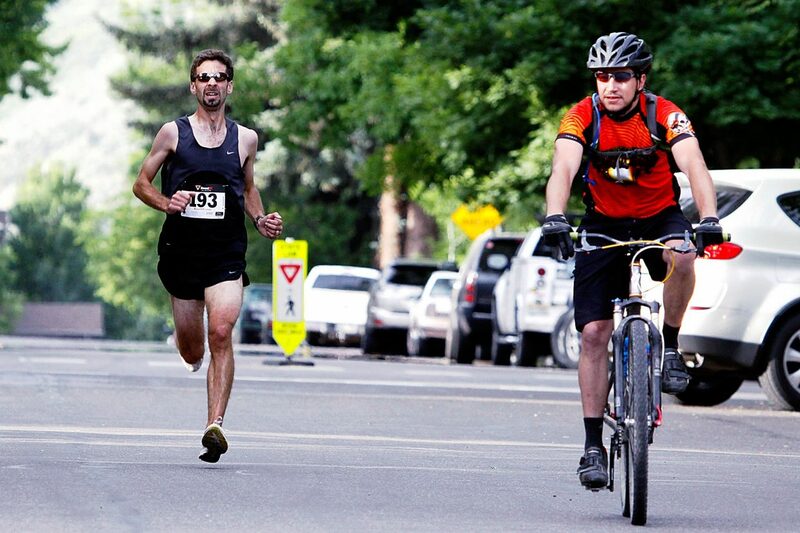 Adam Rich of Colorado Springs runs behind a pace bike as he approaches the finish line during the 37th annual Strawberry Shortcut 10K in Glenwood Springs earlier today. Rich won with a time of 32 minutes, 2 seconds, and also won the 5K. GLENWOOD SPRINGS — Adam Rich has run on national-championship cross country teams, has run countless races over the course of the year and even makes his home within a short jog of the Olympic Training Center in Colorado Springs. So it would figure that he would have won a combined 10K and 5K race by now, right? Rich, who was a team member on Western State’s NCAA Division II national championship cross country teams in 2004 and 2005, crossed the finish line in the 10K in 32 minutes, 2 seconds. He followed that with a winning time of 16:13 in the 5K, needing plenty of time to recuperate from his back-to-back victories. Rich is in the process of completing the Colorado Runner Racing Series, a year-long competition where runners can compete for prize money through their performances in 5K races throughout the state. Runners must complete six 5K races over the calendar year, and scores are calculated based on where the runner finishes in the race. The Shortcut was the fifth of six races this year for Rich, who has run in other races like the Frosty’s Frozen 5-miler in Littleton on Jan. 18, the Valentine’s Day 5K in Denver that was run on Feb. 9, and the Lafayette Quicker Quaker 5K on Jan. 11. His win gave him 100 series points and extended his overall statewide lead in the series. So there’s been a little gap in between his races, but even more of a gap in between when he previously ran in Glenwood in 2006. He’d never had such a short gap between 10K and 5K races, but he made sure that didn’t bother him. “I actually went out a little harder in the 5K so I could give myself a little more of a cushion, just in case,” he said, laughing. Rich beat his nearest competitor, second-place finisher Jordan Chavez (33:58) by nearly two minutes. Chavez is the grandson of former longtime Glenwood Springs High School boys basketball coach Bob Chavez and is a leading candidate to make the U.S. Mountain Running Team this fall. He’s also a member of the University of Richmond cross country team. Rich’s winning time of 16:13 in the 5K beat out the second-place time of Jeo Mendez (16:30), a former distance-running standout at Rifle High School.